The Douglas Skyraider, with its straight, low-mounted, tapered wings, was the only aircraft of its time capable of delivering 8,000 pounds of bombs with dive-bombing precision against such difficult targets as mountain bridges and hydroelectric dams. The AD-4B could deliver nuclear bombs using the "toss-bombing" or "over-the-shoulder" bombing technique. 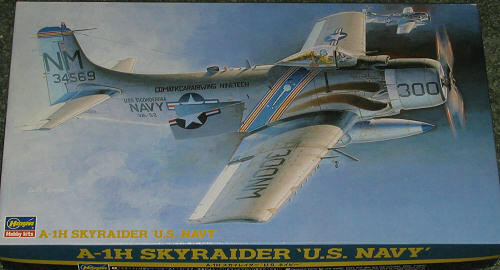 The first AD-1 Skyraider was delivered in 1946 and named according to the Douglas tradition of starting the names of Navy aircraft with "sky." When the Navy, Marine Corps and Air Force numbering systems merged in 1962, the "AD" series Skyraiders were redesignated as "A" series aircraft. During the Korean conflict, the Skyraiders entered service over the Korean Peninsula in October 1951, and by 1955, there were 29 Navy Skyraider squadrons on carriers. In 1964, it was modified for service in the Vietnam War, redesignated A-1E/A-1H, and used by the U.S. Navy and the U.S. and South Vietnamese air forces. Because of its ability to carry large bomb loads, absorb heavy ground fire and fly for long periods at low altitude, the Skyraider was particularly suited for close-support missions. The type was also used by the French and some were later sold to Chad. Though dated 1996, this kit is the most recent one done of the Skyraider. Previously, Airfix, Fujimi, and Tsukuda all did the A-1, but this one eclipses those in terms of detail. 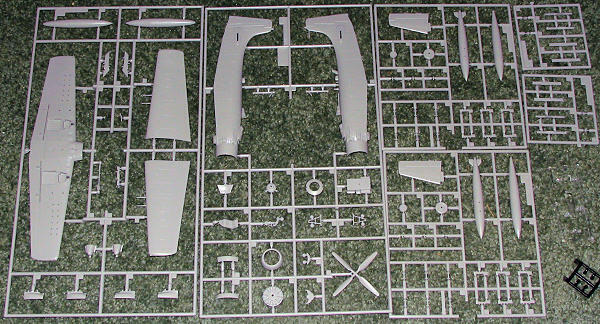 Molded in medium grey plastic and up to the usual standard of Hasegawa with engraved panel lines, and the use of small poly caps to hold in the prop. The cockpit is adequate with a seat, stick and control panel all fitting into the cockpit tub. 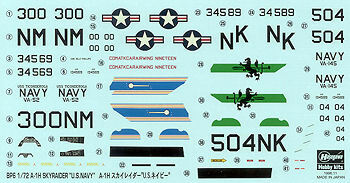 Decals are used for instruments. Judging from what looks like a canvas cover over the area behind the cockpit, it seems this kit has the Yankee extraction system, something that I'm pretty sure was was not used on Navy A-1H Skyraiders. There is a nicely detailed engine and the proper engine cover that was spring loaded to be closed when the engine was not running. This kept salt spray and other crud out. Once the engine started up, airflow opened these so cooling air could enter. It also looks like the kit has the right wheels, these being spoked. The usual mass of weapons pylons are on the bottom of the wing. The kit provided a centerline and two wing tanks. Along with this are four triple rocket launchers. Again, I'm pretty sure these are USAF weapons and not what was carried by Navy Skyraiders. You'll have to delve into one of the Hasegawa weapons sets for a decent load. As tempting as it is to fill all the stations, you have to realize that rarely was this done as all aircraft have to trade carrying capacity (which includes fuel) for range. Instructions are what one would expect after all these years from Hasegawa. They include Gunze and some FS 595 color references. Markings are for two planes. One is the CAG bird from VA-52 as shown on the box art and the other is from VA-145 in predominately green markings. Both are in the Light Gull Grey and White scheme. The decals are nicely printed and should work well as long as you keep them away from setting solutions. It looks to be a fine kit and I know that it was produced in several boxings, both USAF and USN. I've not seen this kit in catalogues for quite some time so availability may well be hit and miss. Thanks to me for providing this preview kit for your added education. If you would like your product reviewed fairly and fairly quickly by asite that has over 325,000 visitors a month, please contactme or see other details in the Note toContributors.